All things come to an end. Except The Simpsons, man’s inhumanity to man and the fact that aviator shades are the coolest thing on the planet. Maine-based Shipyard Brewing’s Fuggles IPA is none of these and has been discontinued which, for some reason, has led to the bargain beer shops of the UK being flooded with it. Your correspondent’s local branches of Aldi, B&M Bargains and Home Bargains have all stocked it recently. Obnoxious divorce lawyers cost a lot of money so until I can pull a dying old rich guy from a car crash and get into his will you’ll have to put up with me cracking the occasional bottle of very cheap beer in the names of journalism and not defaulting on the mortgage. Upon cracking this particular bottle the click-hiss of carbonation I expected is curiously absent (I’ve drank this before but have very little memory of it) and thoughts of Terrible Wrong Things abound. The scent from the bottle neck is a brisk wheatgrass and apricot, the kind of summer smell that makes Everything All Right, and the pour a rusty tone, settling to peach and looking like a hazy desert-planet sky. The bad beer panic subsides a touch. The scent from the glass is that of arboreal cleanliness; it’s more greenhouse and less farmhouse. There are strong notes of lemon zest rising up from beneath the thin, slightly yellow-tinged head of crisp white bubbles. The first taste brings a bright and candied taste of lemon and apricot, two flavours that will remain for most of this beer’s few remaining minutes. As the beer drops beneath the two fingers mark some hints of kiwi fruit bubble and bounce, but the aftertaste has this beaten in terms of complexity. It’s not an explosion in an algebra factory, but the aftertaste throws a few kinks of complication into the drinking experience. There’s an acrid, acidic crackle at times, especially early on, and then later an approximation of celery appears. Too many consecutive mouthfuls leaves a cloggy taste on the tongue; this is a sessionable beer but if you read “session” as “chug” you’ll be feeling all sugared out within moments. And on the subject of sessionability, this tastes nothing of its 5.8% abv. At all. It’s massively light-tasting. It’s also pretty moreish so not a great beer to drink while using those hedge trimmers. With the final few mouthfuls the taste seems pared down to the simple sensations of cleanliness and brightness, and the last glug leaves a fading corona of fruit and sap on the tongue. 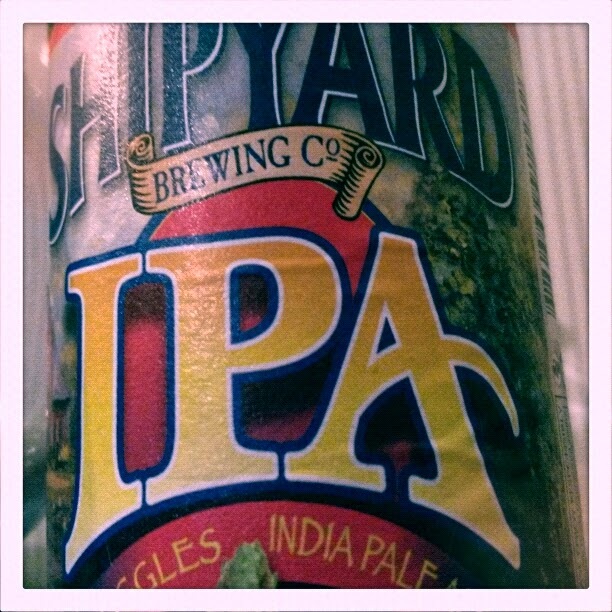 Shipyard Fuggles IPA is a brisk, light-tasting and crisp summery IPA. It won’t be around for you to swig it as you mow the lawn next summer. Raise a glass to its memory. And another! After all, it’s going for like 79p a bottle right now.